Several unrelated things have led a lot of Dartmouthians to wrongly believe that the municipal government is trying to officially erase the name Dartmouth. It isn’t true, and anyone who tells you that this is the plan has not done the research or has some other agenda. I put this Frequently Asked Questions (FAQ) together to answer some of the rumours that are running around. Mailing addresses have not changed. The elections Canada Website appears to be using the Federally designated “Census Area” not municipal community names. There is no Municipal requirement for voter registration and ID to be anything different than the mailing address used by Canada Post. The Census Area has been “Halifax (Regional Municipality)” since 1996. All census areas correspond to municipal boundaries. You can see it being used on the Elections Canada site in the pic below. At least one person in Dartmouth has received a voting card and it arrived with “Dartmouth NS” as the address. Using the census area in this way is a weird Federal thing that has nothing to do with the municipality. 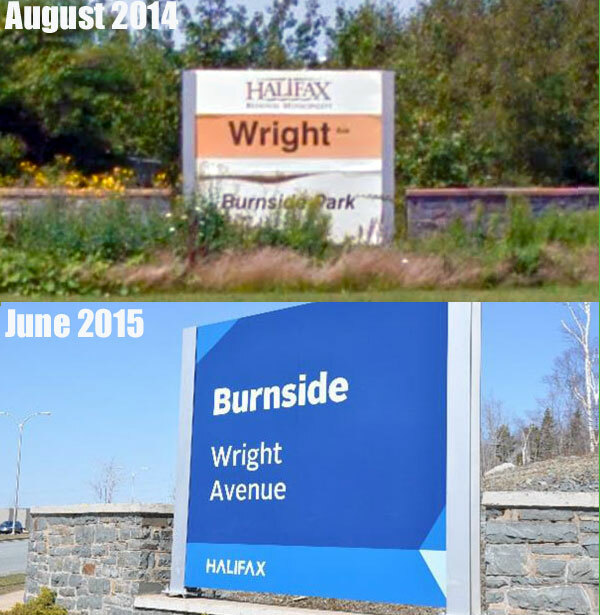 the Sullivan’s Pond community sign had said Halifax Regional Municipality for at least two years (see pics below). 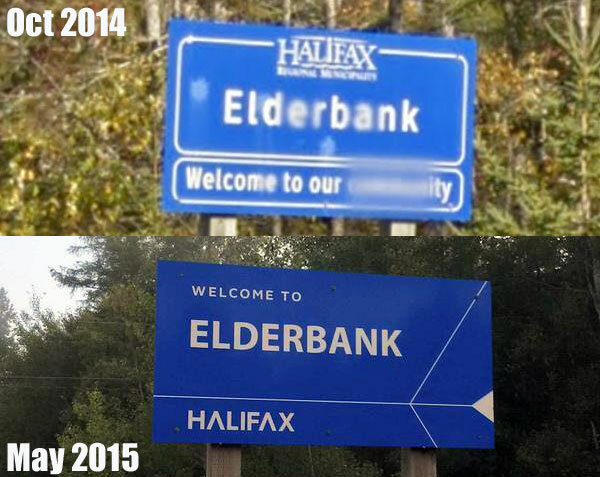 Clearly the use of the Halifax logo was simply changing the logo on the same sign to the new brand. The ferry service was taken over by the regional transit system from the former city of Dartmouth in 1994, before amalgamation. The oldest HRM budget I could find on line refers to it just as the “Ferry Service” back in 2000. There has been no change to the name as a result of the rebranding, see page 127 of the 2000/01 budget. The Municipality is currently re-writing the Municipal Planning Strategy (MPS) and Land Use By-Laws(LUB) for the regional centre plan, ie: Dartmouth inside the circumferential and Halifax peninsula. There will be one new Regional Centre MPS and LUB for both areas. Dartmouth will continue to be described in area plans inside these documents, for example the Downtown Dartmouth sub-area will continue to be used. It will not rename Dartmouth to Halifax, nor will it rename Halifax peninsula to Dartmouth. 4 – ensure that those entering Dartmouth are greeted with “Welcome to Dartmouth” signage. There is no plan remove Dartmouth signs, or any other community sign. The signs are being updated to have the new logo on them. As you can see below, the community name is bigger and more prominent in the new design, the Halifax logo is smaller and moved below the community name. The 2003 community naming policy continues to be in effect. You can read about it in this report. The ‘community’ in the top pic is blurry because I grabbed it from Google Street View, which sometimes does that. How did this happen? Did Council approve this change? The new brand was debated at a regular, advertised meeting of Regional Council, and approved on April 15, 2014. Council then passed a policy on branding around the name, brand and new logo. How come the public didn’t know about it? The branding exercise actually involved one of the broadest consultations in the history of the municipality. Extensive research conducted before, during and after the branding project resulted in more than 2,500 people (at 39 locations including the Black Cultural Centre, Alderney Market/Dartmouth Ferry Terminal, Shubie Park, Cole Harbour Place, Mic Mac Mall, and Woodlawn Library) contributing to the best name for the Halifax region, in addition to 16,000+ visitors to the online portal/social media posts and 1,100 stakeholder and focus group participants. The decision was not done in secret; it got a lot of press. Okay but why? Why did Council suddenly make this change? The rebranding was a key goal of the Halifax Partnerships Economic Strategy since 2011. The goal was to “create and transition to a unique, international brand for Halifax”. The Municipal brand project was directed by Council in part as response to this request. It was seen as a way to “better reflect the region’s best attributes and project the image of the municipality in a more relevant, memorable and compelling manner,” and to better serve the region’s economic development and tourism interests. What about the Burnside signs? Burnside and City of Lakes signs were in really poor repair and needed to be replaced. These signs have said Halifax on them for almost 20 years. The new brand signs make the area name and street name more prominent, and actually make the Halifax logo smaller. Isn’t Halifax Regional Municipality the legal name? Yes, many municipalities have a legal name such as “City of Toronto” in the City of Toronto Act 2006, but logo just says Toronto, and both names are used interchangeably. The legal name “Halifax Regional Municipality” is still used on legal documents, and where appropriate for things like oaths, minutes and formal occasions. How much did it cost to rebrand the city? It must cost a lot of money to paint all those buses and stuff! The municipality continues to replace the old logo with the new brand whenever they going to incur replacement costs anyway. Every year some Halifax Transit buses and ferries are repainted to maintain the appearance and protect the structure of the vehicles. They are now being repainted in the new brand instead of the old design. It doesn’t cost more money to paint on the new design or replace a broken sign, it is money that would be spent anyway. Because of this it will take several years to completely renew the municipal brand. Halifax, Dartmouth and county bus livery 1950-present.